Some Hartford people are pretty desperate for heroes. What other explanation could there be for the recent attempts to glorify gunmaker Samuel Colt? His 19th century factory is now a National Historic Landmark. Does Colt really deserve all this attention? Or are there others who might better qualify as local heroes in Hartford history? Interpreting the past is a tricky business, but there are some things we know for sure. Colt started his career by selling hits of nitrous oxide to curious audiences for a cheap high. Eventually he became a “colonel” who never saw battle, and used bribery to secure lucrative government contracts. He sold weapons to both the North and the South in the arms buildup before the Civil War. He sent his last shipment of guns to the South on April 15, 1861, three days after Fort Sumter was fired upon by the Confederate army. Colt coerced his employees to vote the way he wanted them to, sometimes by stopping the machines and forcing workers to listen to his “suggestions” for which candidates to support. He timed layoffs around elections as a warning to workers that their fate was in his hands. He positioned his secretary at the ballot box where his workmen voted. Colt even kept a secret journal on his employees’ political affiliations, and fired workers who were anti-slavery Republicans. The young, unmarried women who worked for him were employed to produce ammunition, dangerous jobs that Colt kept a safe distance from his precious weapons factory. For this extremely risky undertaking, the women were paid a fraction of what Colt’s male employees earned. But it was Samuel Colt’s position on slavery and abolition, the primary moral questions of the day, that became his most shameful legacy. His defenders say Colt actually opposed slavery, citing a vague reference to a speaker who lectured his workers on the subject. But the facts tell a different story. Colt decried the “Black Republican Devils” he employed, and asked a politician friend to publicly encourage manufacturers to fire employees who supported abolition. Northern business interests “promoted, prolonged and profited from slavery,” according to Complicity, a book written by three Hartford Courant reporters who documented Northerners’ dependence on slavery in building financial empires. 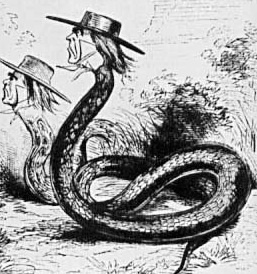 Despite protests from his apologists, Colt was a “copperhead,” a northern Democrat who opposed Lincoln. This profit connection was made crystal clear on Dec. 16, 1859, at Hartford’s city hall. The building was packed with local supporters of “states’ rights,” a coded phrase that justified Southern slavery. Southern states were being unjustly attacked “from a class of men at the North who constantly harp at Slavery,” said one speaker. Another used thinly disguised racist rhetoric to make his point. “Lovers of negroes become haters of white men,” former Hartford Mayor William J. Hamersley told the crowd. Samuel Colt was one of the principal sponsors of the mass meeting. Colt joined the unanimous vote to condemn abolition and those who were trying to increase the pressure on the South to end slavery. There are other men and women who might be promoted in his place as hero of Hartford. 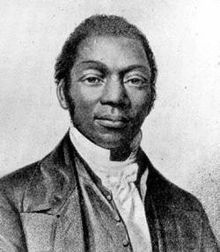 One contemporary of Samuel Colt was James Pennington, the Hartford minister who was actually a fugitive slave. Pennington risked his life to escape to freedom, then risked it over and over again by advocating abolition from his Talcott Street pulpit. We can even look within the industrial empire Colt left after his death for likely candidates. There was William C. Beausang, the Colt employee who led more than 100 machinists on strike in 1912 when the company cut workers’ pay in half. And there was Frank S. Cushman, an inspector of .45-caliber pistols in 1918 who was disturbed about the quality of production at the factory. He wrote to his congressman as a whistleblower and was fired on the same day, with no explanation. Certainly, Rose Santangelo should be considered. Rose was one of 500 workers who, in 1935, risked everything when she went on strike at the Colt factory to win union recognition. With other female strikers, Rose raised funds on downtown street corners and was arrested on the picket line. Not everyone in Hartford is a fan of Sam Colt or gun violence. 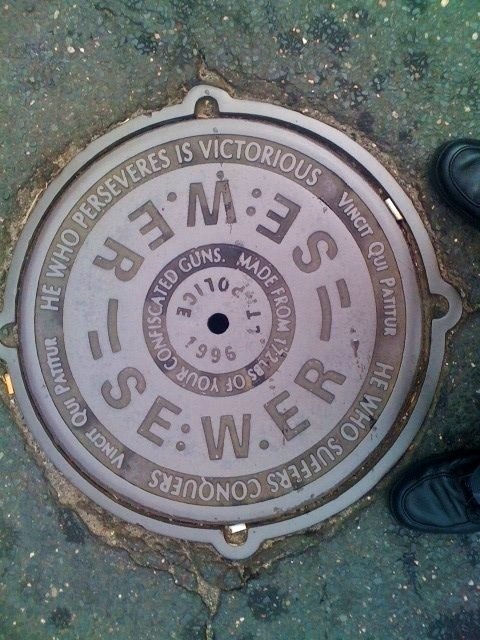 This manhole cover is one of several to be found on the city’s streets. It’s made from melted-down guns. And there is Dorothy Rookwood, who left the Jim Crow South to build a decent life in Connecticut. Dorothy and her husband were employees at Colt Firearms and members of the United Auto Workers union in 1986 when they joined 800 co-workers in a walkout that lasted for four years. The National Labor Relations Board declared Colt guilty of unfair labor practices and ordered their reinstatement with back pay. Ultimately, the workers won the longest strike in state history, and ended up buying the company. Colt supporters can put up as many memorials to the colonel as they want. But let’s get the history straight. 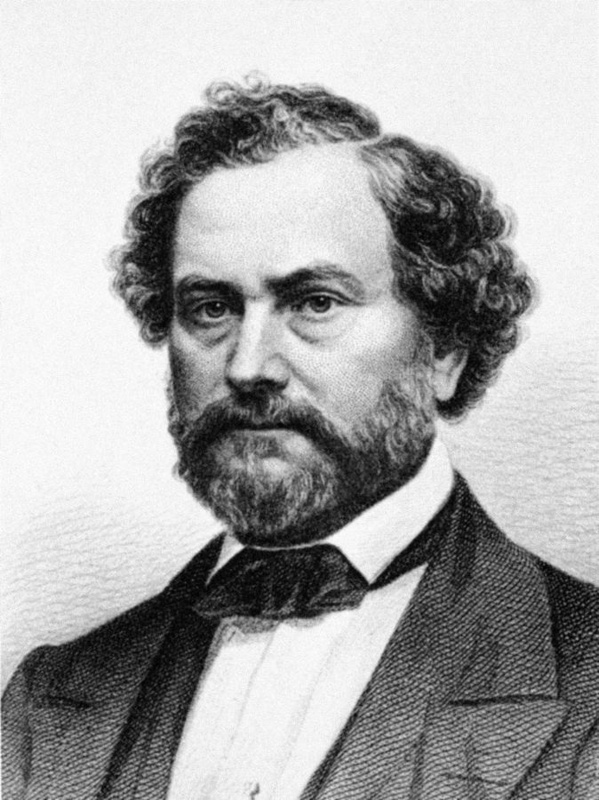 Thousands of Hartford people built the industry for which Samuel Colt is given credit. They are the ones who deserve to be remembered. Thanks for setting the record straight. Like so many others it’s been too easy for me to see what is in plain sight, but not look beneath that surface, to focus on the warmth of my personal interactions and ignore or downplay the racially motivated hatreds and their consequences in the world at large–past or present. 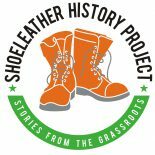 This entry was posted on May 3, 2013 by Steve Thornton in African American, Anti war, Hartford, Labor and tagged abolition, abolitionist, civil war, colt firearms, connecticut, hartford, labor history, radical history, sam colt, samuel colt, shoeleather history, slavery.